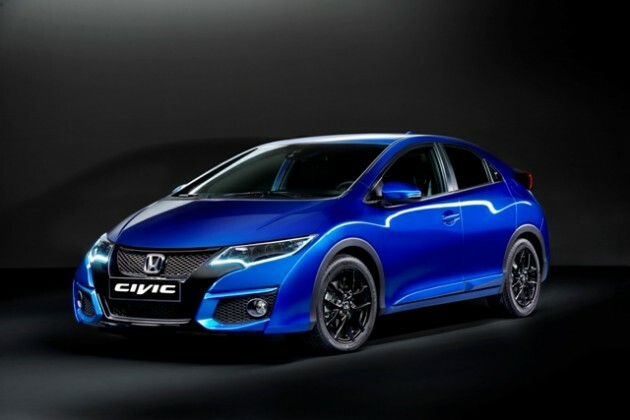 The European 2015 Honda Civic, Civic Tourer and all-new Civic Sport are set to have their debuts early next month at the 2014 Paris Motor Show. But Honda is promoting its upcoming Civics in advance of the Mondial de l’Automobile with these new photos that showcase all three models, with extra attention paid to the line-up’s newest addition, the Civic Sport. The Sport model is based on the Civic hatchback, but borrows a sportier bumper and lower grille mesh from the upcoming Honda Type R. It also features a unique color-coded rear spoiler and 17-inch alloy wheels. The Sport is powered by either a 1.6-liter i-DTEC diesel (118 horsepower) or 1.8-liter I-VTEC (140 horsepower) gasoline engine. As for the hatchback and Tourer, both get exterior and interior styling upgrades that include new headlamps with integrated daytime running lights and a new front bumper. A new rear bumper, side skirts, a black rear spoiler, and LED rear combination lamps are also new to the Civic hatchback. Inside, both get new seat fabrics and headrest stitching, new chrome door handles, and a metallic black control panel. Across the line-up, all 2015 Civic models feature a new standard automatic low-speed braking system, which scans the road ahead and applies the brakes if an imminent collision is detected. All new Civics will also feature the all-new Honda Connect infotainment system, which features internet radio, Bluetooth, internet browsing, (optional) satellite navigation, and a rear-view parking camera.